The gazebo at Cudell Recreation Center is four miles away from the Republican National Convention. It is also a stop on the popular augmented reality game Pokemon Go. But the story told in Pokemon Go isn’t the same story told by Cleveland’s court system. In December 2015, a grand jury neglected to indict the police officers involved in the shooting. They voted that the shooting was justifiable. The text in Pokemon Go suggests otherwise. 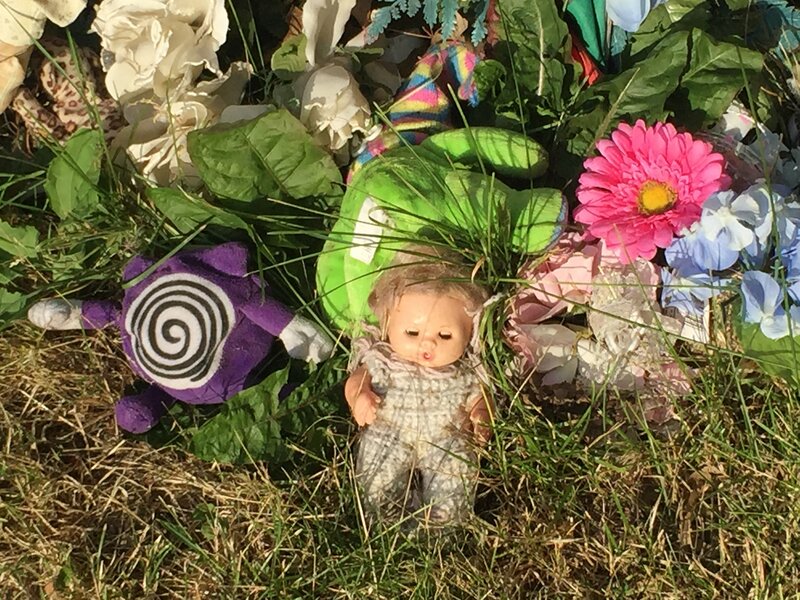 As the text in the game suggests, the community has turned the site into a memorial for Tamir Rice. The gazebo is filled with stuffed animals, crosses, and hand-painted signs. A community garden encircled with brightly-colored rocks blooms next to the gazebo. 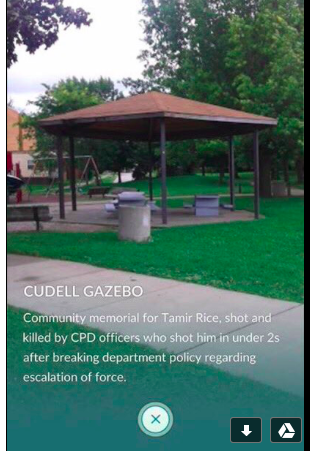 The city of Cleveland had plans to raze the Cudell gazebo before Tamir Rice was killed there. Samaria Rice, Tamir’s mother, had said she supported the city’s plans for demolition and requested a memorial to her son be constructed in its place. 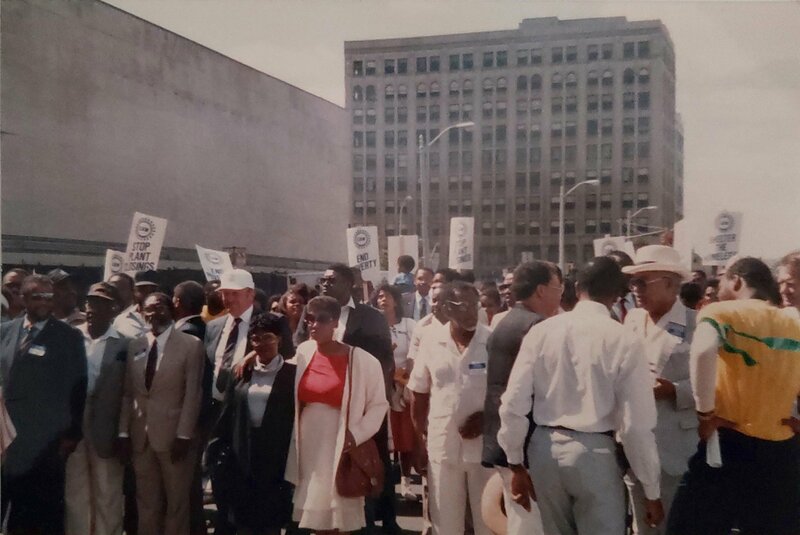 However, in May of this year, amid a flurry of contradictory reports, the city announced that the demolition would be postponed for thirty days. Reports suggested the Smithsonian National Museum of African American History and Culture was interested in preserving the structure, while others alleged that the Smithsonian was not interested and only stepped in to support local Black Lives Matter activists who wanted to see the gazebo preserved. But, for Pokemon Go users, the description of the site included in the game is their introduction. The augmented reality game is filled with historical sites, markers, and monuments. Players flock to these sites, learning about local history as they go from text embedded in the game. Niantic Labs, the makers of the Pokemon Go app, collected information about historical sites and monuments for their earlier augmented reality game, Ingress. 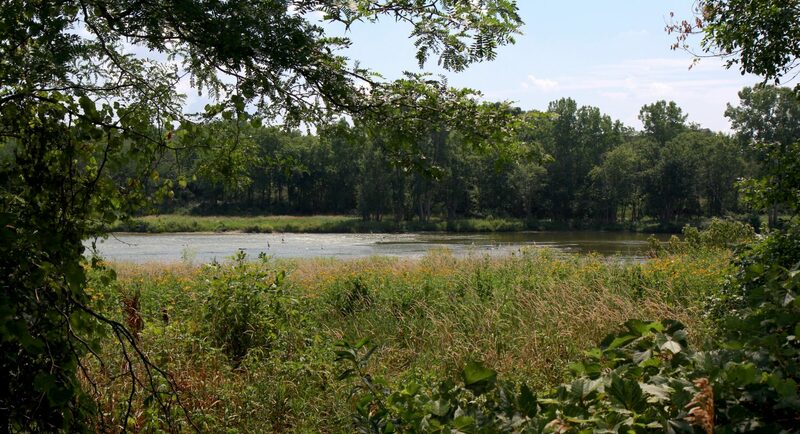 Some of this information came from the Historical Marker Database, which uses crowdsourcing to record the text on historical markers erected by state historical societies and local preservation groups. The stops that aren’t from the Historical Marker Database were crowdsourced by Niantic before the release of Pokemon Go. 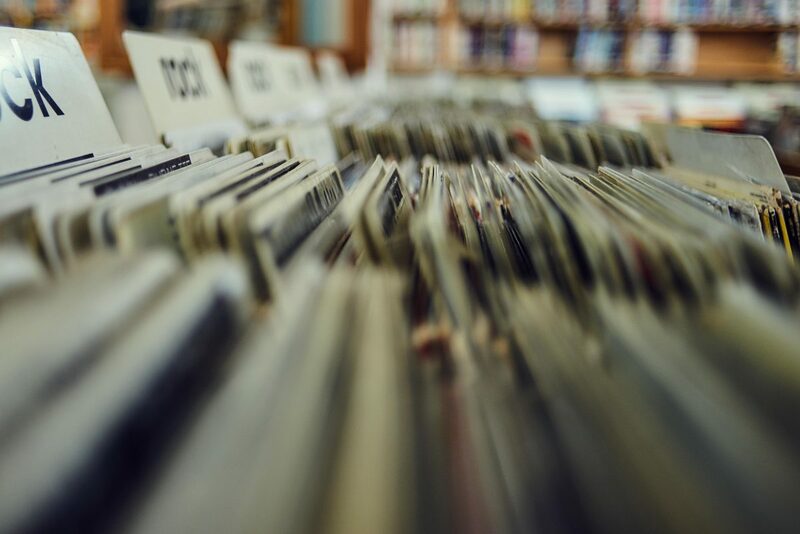 Although Niantic had a review process in place for the submissions, leading to a backlog of submitted sites, they are not forthcoming about what that process entailed. Allowing one person to submit a description of a historically significant location allows that one person to tell their version of the story. While most public historians, museum professionals, and others working in the history field would agree that crowdsourcing history allows for a richer understanding of history, Niantic’s version of history is created by single person one site at a time. Ultimately, Pokemon Go may not have a significant effect on the way society views and understands history. But Pokemon Go players have already shaped how other players encounter history, leading them to forgotten plaques and unmarked historical sites. For Pokemon Go players, the descriptions of the sites included in the game may be the only history of that site that they encounter. While Pokemon Go players seeking fictional creatures flock to monuments and plaques, to statues and memorials, what they’re encountering in reality is a new way of recording history—a kind of history that is shaped by those who are actively choosing which story is important to them and their communities and sharing that story with the world, or at least, other Pokemon Go players. 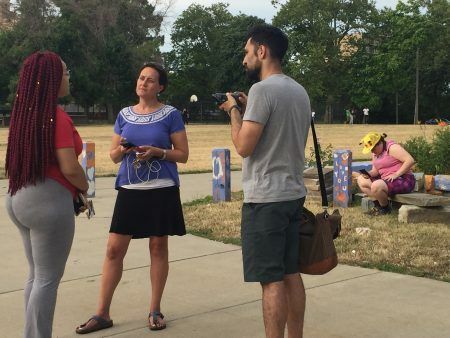 When several Belt reporters went to the Cudell Recreation Center on Monday, July 18, as the RNC began in downtown Cleveland, there were a dozen or so people hanging out in and around the gazebo, talking and playing on the swings. Over the course of half an hour five more visitors showed up, all engrossed in their phones. Video from Belt’s interviews at the gazebo can be found here. Rebekkah Rubin is a Belt summer intern, and public historian and M.A. candidate in history at the University of Massachusetts. She is originally from Canton, Ohio. You can find her on Twitter @RebekkahRubin. Well, this was a bit surreal. I wrote that not long after Tamir died, and never expected many people to read it. The portal was added by another player; like many sites in Ingress (Pokemon Go’s predecessor) the text was initially blank. What I wrote was tempered quite a bit by the potential for review and rejection of the description. I was writing this before many other details were known, but I stand by the accuracy here. The approach was beyond reckless. If anything I wish I could add that the community has been repeatedly lied to about what happened with few real consequences. The complete fabrication told while they hoped to keep the video evidence out of the press has never been addressed. In the final report all claims by the officers are take as gospel by the prosecutor (officers being credible witnesses by definition apparently). There’s a good reason why: trying to match those same claims to a video timeline would make it clear they aren’t compatible with the evidence elsewhere in the report. Memorials are built in the hope people will remember. The events that ended Tamir Rice’s life are something that I worry will be forgotten. It was difficult to see the gazebo pictured without context, and I added a bit without expecting it to be noticed by anyone else. 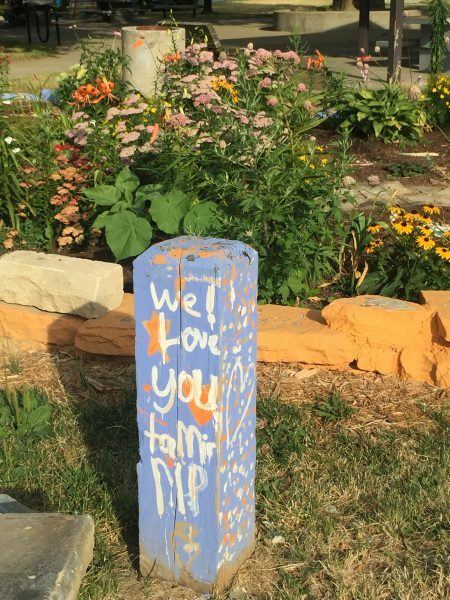 The ability to add additional locations was long ago removed from Ingress, but in the physical world it was wonderful to see the garden created by those who knew him & able to act as a memorial to his young life. I’m really interested in your story and the Pokestop you’ve created. Is there a way I could contact you to talk about the creation of this stop?